We all know that kids love the outdoor life, which is why it's important to protect your children from the worst that the weather can throw at them... after all, as the old Norwegian saying goes, 'there's no such thing as bad weather, just inappropriate clothing!' A good set of kids waterproofs will help your child enjoy the outdoors so much more, as there's nothing worse than being wet and cold when you're trying to concentrate on 'having fun'. CozyMole supply a large range of childrens waterproof clothing from brands including Columbia, Berghaus, Spotty Otter, Gelert, KoziKidz and Muddy Puddles. Our stocked ranges include raincoats, waterproof jackets, trousers and dungarees, plus all-in-one's and splash suits for younger children, toddlers and babies. We cover a range of budgets, and are also happy to supply waterproofs for schools and nurseries - please call to discuss your requirements - we are able to offer further discounts for bulk orders. 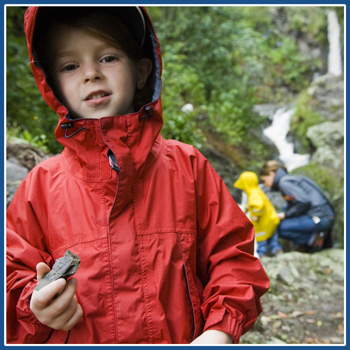 CozyMole stock both insulated and non-insulated ranges of children's waterproof clothing. When buying you should consider whether to buy a waterproof which has integral insulation, or whether a non-insulated version will be better. It's easy to layer-up under a waterproof for colder weather, and non-insulated products do not suffer long drying times if they do get wet. On the other hand, kids that feel the cold more or just want to put one garment on rather than several may be better off with an insulated product. We also have some 3-in-1 products with removeable insulation. At CozyMole, we believe that kids deserve to benefit from the latest technical product developments, as well as adults. Wherever they are available we utilise products which have good breathability ratings and which use 'child friendly' materials. Waterproofs which are too stiff or poorly designed will not win favour - but if your kids are comfortable in their new waterproofs then the weather will no longer be a barrier to outside play. We also remember that you need to be able to wash them in your washing machine. Besides our insulated and non-insulated ranges, we also offer packable waterproofs which have the benefit of being easily storable and fit into even the smallest of rucksacks for when the weather is unkind. If you see a product which you'd like in a size or colour which we do not list, or even a product which we don't carry but is from brand we do have, then just give us a call - we'll be happy to order it in for you pending availability. All of our waterproofs are genuinely waterproof - some products which are available on the market claim to be 'snow-proof', which is often code for 'not water-proof' - ice is not nearly as wet as water! If you actually only need 'shower-proof' then don't forget to look at our other ranges, the softshells in particular - softshells give a high level of rain protection and, although not completely waterproof, offer a great blend of wind and rain protection, warmth, comfort and style. We've listed a few points you may want to consider when choosing a product.